The North Yorkshire Sport "Pass On Your Passion" campaign is designed to encourage more women into coaching sport. Husthwaite's Primetime, an inclusive sports club for people of all ages and abilities, is competing for one of three £50.00 prizes. Prizes will be awarded to the most inspirational coaches, who pass on the ceremonial baton and encourage newcomers to take up the running. In 2014 Joe McKechnie, Hambleton's Disability Sport Officer, trained volunteer Chloe Hunt to lead Primetime games. Chloe is now the regular coach for Husthwaite. 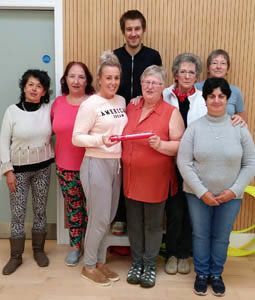 She is pictured here with community volunteer Sandie as she hands on her ceremonial baton, her passion for sport and her expertise. Relays of volunteers now take it in turn to lead the Primetime games and gain new coaching skills. If you are inspired to become a Primetime volunteer, clubs in Husthwaite, Topcliffe, Stillington and elsewhere in Hambleton gladly welcome new talent! Caption: Joe with Chloe, Sandie and Husthwaite community volunteers.